Glycine acts as an inhibitory neurotransmitter at glycine receptor (GlyR)-enriched synapses and as an obligatory co-agonist at the N-methyl-D-aspartate (NMDA) receptor, where it facilitates neuronal excitation. Two high-affinity and substrate selective transporters, glycine transporter-1 and glycine transporter-2 (GlyT-1 and GlyT-2), regulate extracellular glycine concentrations within the CNS and as such, play critical roles in maintaining a balance between inhibitory and excitatory neurotransmission. 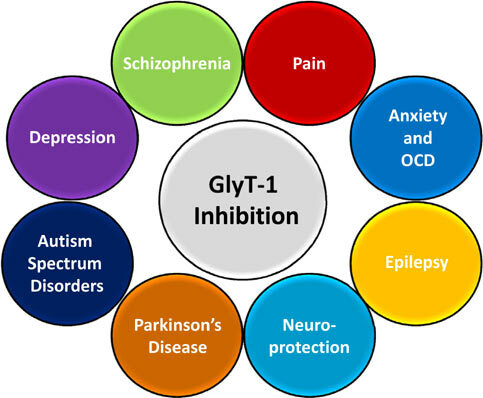 GlyT-1 inhibition has been extensively examined as a potential means by which to treat several CNS disorders that include schizophrenia, depression, anxiety, obsessive compulsive disorder (OCD), and addiction. More recently, preclinical studies have emerged that indicate the approach may also promote neuroprotection, provide a pharmacotherapeutic strategy for autism spectrum disorders (ASDs), and treat symptomology associated with pain, Parkinson’s disease, and epilepsy. This review examines the pharmacological aspects of GlyT-1 inhibition and describes drug discovery and development efforts toward the identification of novel inhibitors. Glutamate, Glycine, Glycine Receptor, Glycine transporter, GlyT-1, GlyT-2, NMDA receptor, Sarcosine. Department of Medicinal Chemistry, AMRI, East Campus, 3 University Place, Rensselaer, NY, 12144.